We’ve covered finding featured snippet opportunities. We’ve covered the process of targeting featured snippets you want to win. Now it’s time for the third and final piece of the puzzle: how to monitor and measure the effectiveness of all your efforts thus far. In this episode of Whiteboard Friday, Britney shares three pro tips on how to make sure your featured snippet strategy is working. So we’ll jump right in. So there are a couple different steps and things you can do to go through this. First is just to manually resubmit a URL after you have tweaked that page to target that featured snippet. Super easy to do. All you do is go to Google and you type in “add URL to Google.” You will see a box pop up where you can submit that URL. You can also go through Search Console and submit it manually there. But this just sort of helps Google to crawl it a little faster and hopefully get it reprioritized to, potentially, a featured snippet. From there, you can start to check for the keyword in an incognito window. So, in Chrome, you go to File > New Incognito. It tends to be a little bit more unbiased than your regular browser page when you’re doing a search. So this way, you’d start to get an idea of whether or not you’re moving up in that search result. So this can be anywhere from, I kid you not, a couple of minutes to months. So Google tends to test different featured snippets over a long period of time, but occasionally I’ve had experience and I know a lot of you watching have had different experiences where you submit that URL to Google and boom — you’re in that featured snippet. So it really just depends, but you can keep an eye on things this way. So, in my test set, I have seen an average of around 80% increase in those keywords, just in rankings alone. So that’s a good sign that we’re improving these pages and hopefully helping to get us more featured snippets. Then this last kind of pro tip here is to check for other instances of featured snippets. This is a really fun thing to do. So if you do just a basic search for “what are title tags,” you’re going to see Moz in the featured snippet. Then if you do “what are title tags” and then you do a -site:Moz.com, you’re going to see another featured snippet that Google is pulling is from a different page, that is not on Moz.com. So really interesting to sort of evaluate the types of content that they are testing and pulling for featured snippets. Another trick that you can do is to append this ampersand, &num=1, &num=2 and so forth. What this is doing is you put this at the end of your Google URL for a search. 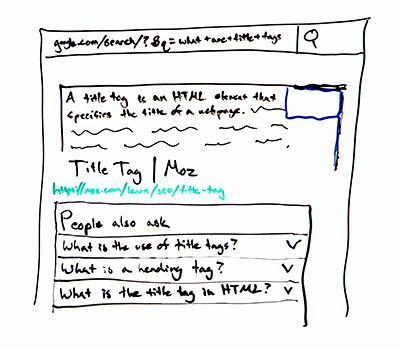 So, typically, you do a search for “what are title tags,” and you’re going to see Google.com/search/? that typical markup. You can do a close-up on this, and then you’re just going to append it to pull in only three results, only two results, only four results, or else you can go longer and you can see if Google is pulling different featured snippets from that different quota of results. It’s really, really interesting, and you start to see what they’re testing and all that great stuff. So definitely play around with these two hacks right here. Then lastly, you really just want to set the frequency of your monitoring to meet your needs. So hopefully, you have all of this information in a spreadsheet somewhere. You might have the keywords that you’re targeting as well as are they successful yet, yes or no. What’s the position? Is that going up or down? Then you can start to prioritize. If you’re doing hundreds, you’re trying to target hundreds of featured snippets, maybe you check the really, really important ones once a week. Some of the others maybe are monthly checks. From there, you really just need to keep track of, “Okay, well, what did I do to make that change? What was the improvement to that page to get it in the featured snippet?” That’s where you also want to keep detailed notes on what’s working for you and in your space and what’s not. So I hope this helps. I look forward to hearing all of your featured snippet targeting stories. I’ve gotten some really awesome emails and look forward to hearing more about your journey down below in the comments. Feel free to ask me any questions and I look forward to seeing you on our next edition of Whiteboard Friday. Thanks.